I seem to be lurching from one DT challenge to another just now. I had planned to have a crafty day on Sunday but that didn't quite pan out as hoped. It was a gorgeous day so I changed beds and got them out to dry then my friend popped in and of course we sat and chatted, ate Easter biscuits and made some jewellery! Tomorrow always is another day but unfortunately catches you out now and again! Today is time for Team B's challenge at Moving Along with the Times. The theme this time was chosen by Tammy and I hope the gorgeous cards the DT have made will inspire you to join in. Scheduled post today as I'm off to Dundee with my friend to meet up with her sister, lunch then an afternoon session of Bingo! Fingers crossed we're lucky. brilliant card Anne, I like the image the design and the colours. That book he is holding looks like a mother's worst nightmare! Your card is fantastic! Great composition and use of the colors. Thanks for playing with us at JUGS! This is so gorgeous Anne. Awesome colours/image and layout. What a hectic life you do lead sweetie. Fabby male card Anne, love the orange. Hope you were lucky this afternoon! This is a brilliant card Anne, great image. I hope your were lucky at the bingo. I'm sorry to reply so late, but the circumstances have not been very good lately! Despite the delay, I want to say thank you for your nice comment ... I enormously appreciated. Your card is super nice! Me too, I need a card for a young man who will celebrate its 8 years, and maybe ..... I'll inspire me of yours! This is gorgeous Anne! such a fab image and I love the scrummy papers! wonderful sentiment too! it's a perfect male card! 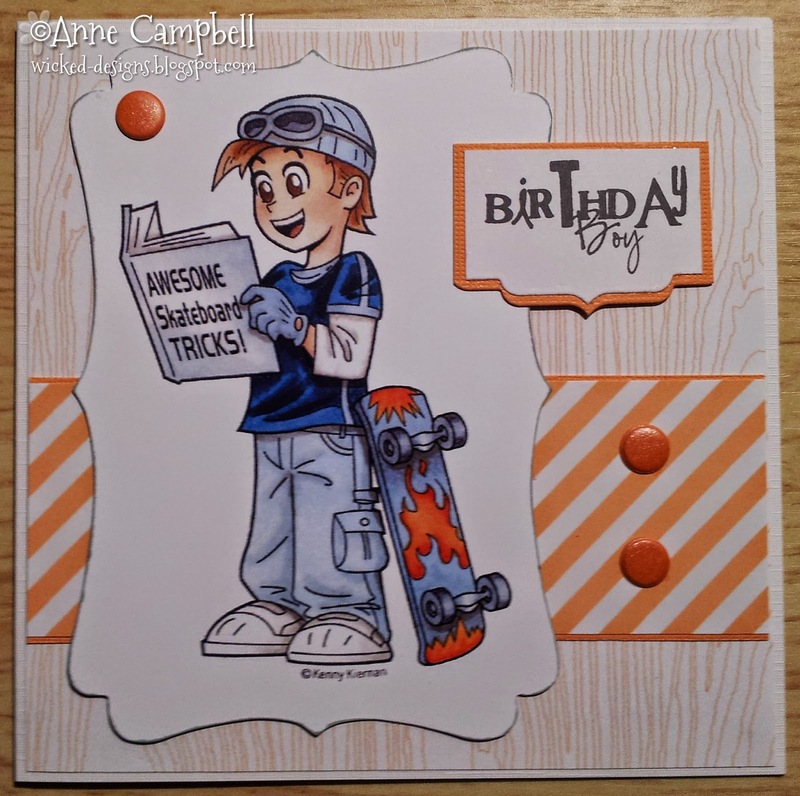 Sweet image and card, perfect for a teenager! I like the colors of this design too!